HERSTORIA, my first novel, has now been published and been followed by my second, GREEN STONES, and my third, PERSIAN CARPET. The price is £7.99 plus £1.50 p&p. ‘HERSTORIA – a life out of time’ – is a four-part story about Brieze, who loses first her mother at the age of three, then her father when she was fourteen. At twenty-eight she is heading for a crisis but then remembers that her grandmother had taught her how to travel outside of Earth time. By re-visiting the proverbial history books of time Brieze comes to realise that the connection she has with her loved ones, and ultimately with her soul, goes far beyond this one life-time. Not only does Brieze meet her spirit guardians in different characters, but she discovers where she has known the souls of her parents and her children before. She even meets her grandchildren before they are born in her present time. Other relationships reveal their deeper meanings, too. It shows her, in an unmistakable way, that she is part of a timeless relationship-family and her own earthly personalities are transient. It heals her loneliness and sense of loss by helping her understand that she is not really separated from her loved ones by death. Most importantly for Brieze at that time, she also comes to understand that she can be the vehicle for others to arrive into the Earth realm. It also helps her see that the relationships she engages in are more important than she realised and everyone around her is there to love her, and for her to love. There are times in one’s life where an understanding of our Higher Condition can make all the difference, when making choices to follow our Soul’s purpose. Without that understanding we may get lost in negative aspects of our lower ego and lose our direction.This is not a new concept in the esoteric teachings of the world, which is to understand the karmic cycle of re-incarnation and its purpose in transcending the base animal life towards a higher conscious state.The pages of history hold unexpected clues to these mortal and spiritual relationships, for it is all in our evolution, where we have come from. What is yet to be written, the future, is no less difficult. All we have to do is let our experience, imagination and conscious choices take us there. Each of the stories present different ways in which Brieze discovers a past, or future, incarnation, which helps her to understand herself more. The experiences come at significant times of change in her life – motherhood, grand-motherhood, embarking on a career later in life and finally, at the time of contemplation of her mortality, at the end of her life. ‘HERSTORIA’ as reviewed by John Lehman, writer, poet and book reviewer from Wisconsin, USA. In the final pages of her book, author Wendy Salter states, “To believe in the eternal spirit, therefore, we have then to embark on the eternal search for that place from whence we have come and to where we are going.” That’s exactly what Brieze the narrator/protagonist of this four-story novel does. Through each of these episodes in different places and different times she (and we) comes to realize a wonderful connectedness with loved ones past, present and future. I appreciated the overview of each part before “Story One” it helps the reader grasp the scope of the book and anticipate each of its different parts. My favorite was the contemporary encounter of the third section, but I also liked the first; my wife found the second most inspiring — Brieze travels back to spend time with Native American’s in the early 1600s. But each of the four stories has an important underlying meaning: (the first) things have greater meaning than they initially appear to have; (the second story) nature is part of us and we regain ourselves by losing ourselves in it; (third) a partner in life helps us remember; (and fourth) the future — who we will become — shapes the present just as the past has. But the whole of this book is more than the sum of its parts. This book is well written. The transitions to different time periods are flawless and Salter’s grasp of historic detail gives each account real credibility. There is a temporary change of point of view in the first part developing the French revolutionary’s family more quickly, that is a little distracting and I found the second story more reflective with fewer scenes of character interaction that would have made it more dramatic. This is quickly rectified with the dynamics of the encounters between Brieze and the deaf man in the third story. The last section is a brief, (somewhat expository-heavy) glimpse into the crystal ball of the distant future. But what I enjoyed most about this book is that we, as readers, are acknowledged to be searchers. When the book is over and Brieze’s journey is complete, we are well on a trail of discovery about our own lives. 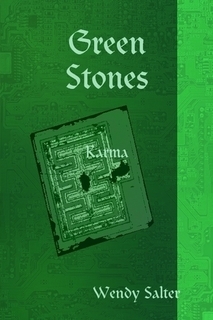 ‘GREEN STONES’ – my second book, is a story of past-life karma. Sometimes, what we know from our present life doesn’t answer a strange and difficult experience we may have. It may be time to visit the past. Following on from Wendy Salter’s first book, ‘Herstoria’, this book takes the subject of past-lives deeper into the karma brought forward from a past-life into the present. ‘GREEN STONES’ is set in the beautiful sun-drenched turquoise Aegean Sea around Turkey and delves into the surfacing past-life of Louise, an English woman who finds her connection to a famous pirate, Captain Oruc. 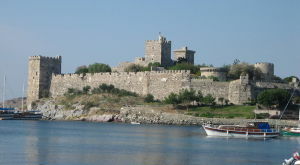 How can her present life, set in 2004, reconnect to Captain Oruc back in 1503, and a city renown for one of the Seven Wonders of the Ancient World – Halicarnassus, now known as Bodrum? There, St Peter’s Castle, the last stronghold of the Knights of St John of Jerusalem, holds an unexpected secret. This is a heart-rending story of hatred, betrayal and intrigue, survival, passion and pain, but it is love that endures. It is based on a true story. Alongside the fiction and the fact, the author makes a study of an ancient, mysterious esoteric wisdom, which is resurfacing at this time in a spiritual understanding of re-incarnation and karma. When our lives unfold, not in a pre-ordered and simplistic fashion, but in a surprising and challenging way, we can find purpose and fulfillment through an understanding of re-incarnation and the opportunities it offers. Unbelievers of the transmigration of the soul see the human existence as just a procreation of the species, but a simple question must expand the mind into other possibilities – For what purpose? Thousands upon thousands of testimonies lend evidence to the idea that we return to incarnation many times. Is it too preposterous to imagine that we can accumulate knowledge from life-time to life-time, and through experience gain a wisdom that enlarges our existence into a fully conscious, evolved being? ‘PERSIAN CARPET’ – my third book, is a story beyond Death’s Door. Have you ever wondered what lies beyond Death’s Door? In Wendy Salter’s third book, she takes a diversion from past-lives into the mysterious World of Spirit, between incarnations. 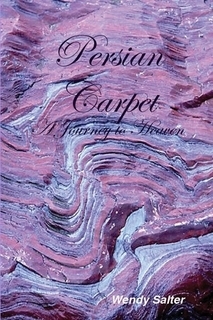 ‘PERSIAN CARPET’ – The protagonist, Beatrice, thinks she knows where she is going, but she didn’t know the outcome of her surprising journey into Old Persia and beyond. She meets not just one companion, Ishaq, but a second, a guide called Pir, and together they explore this different dimension of the living universe. Just as the old Persian Carpets earned a reputation for ‘flying’ in Old Persia, Beatrice finds a Persian Carpet that can take her beyond her wildest dreams. The outcome of this journey leaves Beatrice with a dilemma. In this story, Beatrice is not just the story-teller but the explorer in a world not too dissimilar to our own, while presenting some significant differences as her free-consciousness is less restricted by space-time. In her transition from Earth-Time to Spirit-Time, the journey seems common-place at first, with familiar modes of transport, but she crosses the Rainbow Bridge and from thereon she knows she has arrived in a very different place. Conversations reveal some enigmas of the spirit-world, especially when they involve the numerous characters she meets, who each have their own story to tell. Beatrice goes through ‘death’s door’ consciously and with purpose, as she has undertaken a mission to investigate the possibilities and locations of numerous kinds of ‘portals’. The blending of history, mythology, philosophy and speculation contrive to expose the creative abilities of the conscious mind, set free in an environment of imagination we may call an alter-reality. Having gained important insights, Beatrice then has a choice, armed with a new understanding of herself – what to do next. Coming soon – Book four will follow Beatrice’s decision to continue and in so-doing she will endeavour to discover long-lost ancient history that could explain the early Path of Humanity, where the Path divided, and the potential it now has to dream-up its own future. As an increasing number of people open their minds and retrieve their lost memories of who they truly are, commonly known as ‘waking-up’, the barrier of disbelief we have constructed around us will dissolve to reveal – what?